Beauty is more than skin-deep; it comes from within – from the gut, to be precise. 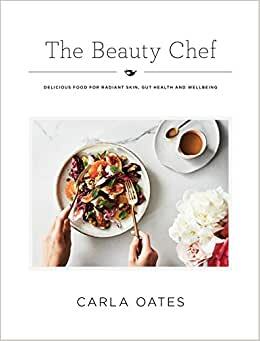 In The Beauty Chef Carla Oates, founder of the natural beauty company of the same name, combines the joy of cooking with the science of nutrition, offering you radiant skin and robust health. More than 150 delicious and nutritious recipes that are gluten-free and mostly dairy-free recipes will feed both your skin and your gut. Glamorous it may not be, but a well-balanced gut bacteria can be the answer to glowing health and beauty. With every meal you eat, be it breakfast, dinner or a tempting dessert, you will feel and look better inside and out. Carla Oates is the founder and ‘chef’ behind Australian beauty and wellness brand The Beauty Chef. Named ‘The Skincare Innovator’ by Net-A-Porter magazine, she is author of the best-selling book Feeding Your Skin and editor of the Wellbeing Beauty Book. A naturalist and gut-health advocate, Carla is the natural beauty columnist for Wellbeing Magazine, and runs regular Beauty Chef workshops in Sydney; she is a Goodwill Ambassador for Australian Organic and has been researching, writing and teaching on organic beauty and health for the past 15 years. I initially bought this cookbook because it looked beautiful and I thought the recipes would be healthy and "beauty-beneficial". I was a bit skeptical that any of the recipes would be tasty when I saw that most (if not all) of the recipes are gluten free and call for a lot of buckwheat, amaranth, and a lot of other grains that are not known for being delicious, but healthy. I've made a lot of baked goods that are sugar and gluten free and they are barely digestible, and on a good day you can talk yourself into thinking they are kind of OK. However, these recipes are actually REALLY GOOD. I have made the Buckwheat and Seeded Bread and it has now replaced my morning English muffin - it's very tasty and filling and really easy to make. Last night I made the Beetroot and Chocolate Brownies and I am stunned to report that I think they are better than regular brownies, and knowing that they are added sugar free is amazing! I have also made nearly all of the breakfast recipes and the Rainbow Chard Tart - all of which have been really filling, delicious, and satisfying. I was sure this was just going to be a very pretty book to add to my cookbook collection, but I am using it on a daily basis and my digestion and energy levels have really improved. I highly recommend the book! This is a great book and very informative. There is absolutely nothing wrong with the book, or it's content: I just have a hard time finding the recommended ingredients here in the US, and the book does not address substitutions.. Not a big deal because as a personal chef, I can figure that out. But it would be helpful to those who are not real good in the kitchen. I love this cookbook so much that I purchased one for my mom as well. The photos are gorgeous, the matte paper is sophisticated, and most importantly - the recipes are delicious. I was a little worried they'd be complicated, and I'd have difficulty finding the ingredients, but she uses many of the same ingredients throughout, which makes purchasing things like Almond Flour not so bad. I was pleasantly surprised to find this a true cookbook with good narratives, easily acquired foods, nothing too eccentric and a well-balanced selection of meal options. There is nothing super preachy or kooky. I have no idea if the science is true, but it seems like following this type of lifestyle would have its advantages. There are a few disappointments, one of which is the recipe for Middle Eastern-spiced Walnut and White Bean Balls. The narrative describes this as a dish made great by the use of ras el hanout and za'atar. Neither of those ingredients can be found in the recipe details, however. There are similar types of herbs and spices used, but it seems it was a last minute decision to make the ingredients more commonplace, without amending the author's notes. I haven't scoured each recipe in the book for similar errors or omissions and this is by no means uncommon in today's rush-to-publish environment, but it is frustrating. It's a beautiful book, formatted in a modern style with Insta-worthy photos and, overall, I'm happy to have it on the shelf. Love this book!!! It's for people who like to take time cooking though. But the recipies are heavenly. It Has many recipies for gluten alternatives. Gut flora extra-friendly.